Humans have spread D. simulans from Africa to the rest of the Earth. Photo by Dr. Andrew Weeks via Wikimedia Commons. 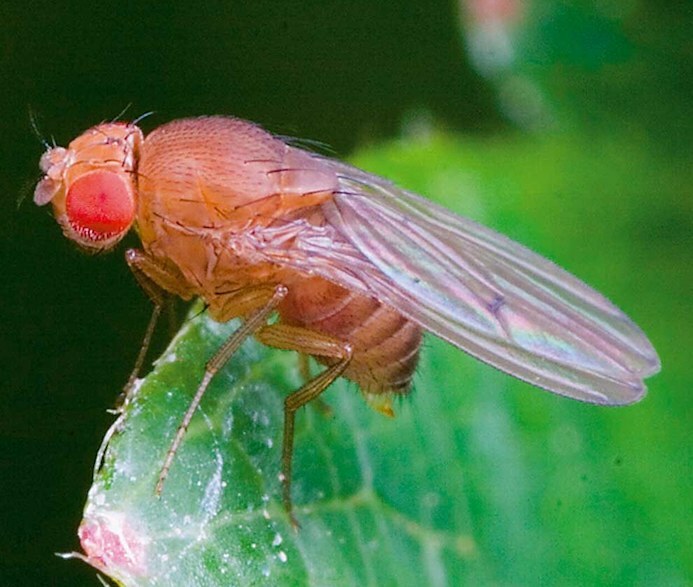 Thanks to more than a hundred years of working with Drosophila melanogaster, geneticists have many powerful tools for precisely manipulating its genes. It has also become a model system for studying speciation and molecular evolution together with the other members of the melanogaster species group: D. simulans, D. mauritiana, D. yakuba, and D. santomea. However, evolutionary genetic studies have been hampered by an inability to make transgenic lines within the less well-studied species. In the April issue of G3, Stern et al. present a panel of new transgenic strains of these species designed to make fine mapping and functional genetic studies possible. These resources provide new opportunities for unraveling the genetic mechanisms of speciation and evolution. Transposable elements are selfish genetic elements that insert themselves into new genome locations. This natural machinery has been adapted by scientists to introduce carefully designed DNA constructs into genomes. Stern and colleagues used the piggyBac transposon system to insert a fluorescent reporter gene into hundreds of random locations in the genomes of five different Drosophila species. They mapped the location of each insertion and identified the unique insertions that could be maintained in homozygotes, resulting in 184 D. simulans lines, 122 D. mauritiana lines, 104 D. yakuba lines, and 64 D. santomea lines. Each line has an insertion in a unique genomic location coupled to a fluorescent reporter gene whose expression can be easily detected in the eyes with a microscope. The huge collection of unique locations will make fine mapping in these species much easier. Coupled to many of the insertions is a landing site that can be used to add new insertions via plasmids carrying a suitable targeting sequence. The authors tested the integration efficiency at landing sites in unique genomic locations and identified those with high efficiency that could be maintained as homozygotes. They also tested the effects of insertion location on expression by transforming a fluorescent reporter gene linked to an enhancer of even-skipped, a developmental gene in D. melanogaster with well characterized expression patterns. In four of the five species tested, at least one strain showed the expected patterns of expression, suggesting that any gene of interest transformed into these sites will not be subject to ectopic expression from location effects. Additionally, they used CRISPR/Cas9 gene editing to knock out expression of the fluorescent eye reporter in a number of strains. Since strains still have the landing site in known locations, they can be used to examine expression of genes of interest in the eye without interference from the reporter. 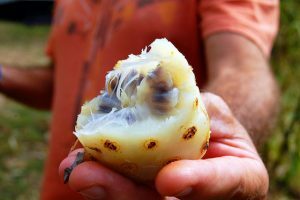 Noni fruit is toxic to most other fruit flies, but <i>D. sechellia</i> loves it. Photo by Carmen via Flickr. The fly species of D. melanogaster species group are notable not just for their close relationship with the famous D. melanogaster, but they also make excellent evolutionary models in their own right. D. melanogaster and D. simulans are cosmopolitan species that live wherever humans do, but the other members of the group are found only on islands off the coast of Africa. D. sechellia is a member of the group that feeds primarily on a fruit toxic to most other animals. Despite the adaptive differences that come with these divergent lifestyles, many of these species can still hybridize, making laboratory studies aimed at dissecting these differences possible. The transgenic lines presented in this paper will make studies on speciation and adaptation in these lineages more powerful and accessible than ever before. Stern, D. L., Crocker, J., Ding, Y., Frankel, N., Kappes, G., Kim, E., Kuzmickas, R., Lemire, A., Mast, J.D. & Picard, S. (2017). Genetic and Transgenic Reagents for Drosophila simulans, D. mauritiana, D. yakuba, D. santomea, and D. virilis. G3: Genes, Genomes, Genetics, 7(4), 1339-1347.